In Pursuit of Prosperity provides a much needed exploration of the evolution of environmental sustainability in U.S. foreign policy. Through expert analysis of nine countries and regions of strategic importance, David Reed and his stellar team of experts in foreign policy and environmental affairs identify emerging threats to the prosperity and national security of the United States. They assert that U.S. foreign policy must shift away from its 100-year-old focus on obtaining energy and mineral inputs for the industrial economy. In the new millennium, U.S. foreign policy must be geared toward ensuring the prosperity of the country’s trading and political partners around the globe. To the degree that our partners’ economies and social stability are threatened by the natural resource scarcities and environmental change unfolding within their borders and in neighboring countries, threats to U.S. prosperity and national security increase proportionately. Directed to U.S. foreign policy makers, the intelligence and security communities, and influential think tanks and research organizations, the book proposes specific recommendations the U.S. government should embrace to respond to the disruption of global supply chains, social instability in partner countries, disruptive impacts on regional relations, and expansion of illegal trade and criminal networks. This unique focus establishes In Pursuit of Prosperity as a seminal work in understanding the challenges facing the United States in this period of global environmental change. 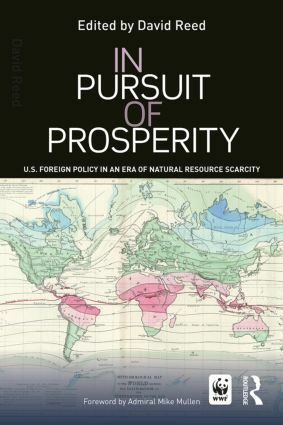 "In Pursuit of Prosperity articulates a compelling case for more clearly and closely linking natural resource scarcity and environmental trends to U.S. national security policy. Thoroughly researched and well-documented, this is an important and timely book for policy makers and national security practitioners". "The combined effects of natural resource scarcity and climate change pose both immediate and longer-term challenges to the business practices and supply chains of every global company. As this compelling book makes clear, ignoring these twin threats comes only at great peril". "A much needed hard look at the risks associated with growing resource scarcity in our increasingly complex and interdependent global system -sounding not just an alarm our leaders should heed, but offering substantive, thoughtful direction for US leadership going forward." — David Rothkopf, CEO and Editor of Foreign Policy magazine. David Reed is Senior Vice President, Policy for WWF-US. He holds a Ph.D. and graduate degrees from the University of Geneva, Switzerland. He has worked for twenty five years in social and economic development programs in Latin America, Africa, and Asia at both the grassroots and managerial levels. Areas of expertise include Environmental impacts of macroeconomic reforms, Poverty-environment nexus, International architecture for climate finance, and environmental dimensions of U.S. foreign policy.